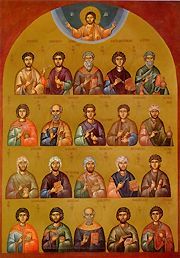 These Saints lived during the years of Diocletian. Saint Cyrus was from Alexandria, and Saint John was from Edessa of Mesopotamia. Because of the persecution of that time, Cyrus fled to the Gulf of Arabia, where there was a small community of monks. John, who was a soldier, heard of Cyrus' fame and came to join him. Henceforth, they passed their life working every virtue, and healing every illness and disease freely by the grace of Christ; hence their title of "Unmercenaries." They heard that a certain woman, named Athanasia, had been apprehended together with her three daughters, Theodora, Theoctiste, and Eudoxia, and taken to the tribunal for their confession of the Faith. Fearing lest the tender young maidens be terrified by the torments and renounce Christ, they went to strengthen them in their contest in martyrdom; therefore they too were seized. After Cyrus and John and those sacred women had been greatly tormented, all were beheaded in the year 292. Their tomb became a renowned shrine in Egypt, and a place of universal pilgrimage. It was found in the area of the modern day resort near Alexandria named Abu Kyr. From divine grace, ye received * the gift to work awesome marvels: * thus, O Saints, throughout the world * ye ever work signs and wonders; * and ye cut out all our passions * and all our suff'rings * with an invisible surgery, for ye truly * are divinely-wise physicians, * O godly Cyrus, * and John, beloved of God. Share the feast of Cyrus & John the Unmercenaries with an icon greeting ecard.